Located in the western Caribbean Sea, this British overseas territory is composed of three distinct islands. The largest, Grand Cayman, is a beach resort destination with great diving and snorkelling, whilst its little sister, Cayman Brac, offers great deep-sea fishing, with tuna, barracuda, and marlin. A relaxing trio of islands perfect for relaxing, and undersea beauty that wonders both novice and expert divers. This stunning trio is composed of Grand Cayman, Cayman Brac and Little Cayman, and whilst sharing some obvious family traits, each island differentiates itself from the others by their distinctive characteristics. A British Dependent Territory, the islands derive their names from Caiman which is a type of crocodile that used to roam this part of the Caribbean. The three islands now make for a popular holiday spot where you can choose to either be in the middle of the action on Grand Cayman or head to the smaller, less-travelled islands for fantastic diving and bird-watching. Around 480 miles south of Miami- around a 45 minute flight- Grand Cayman is the largest island at 76 square miles, and a noted financial culture, with more than 500 international banks represented, including nearly every one of the top 50 in the world. But most visitors don’t come here for the banks… they come here for the famous Seven Mile Beach (really only 5 1/2 miles long)! Though luxurious hotels, condos and high-rises fill the oceanfront, the gorgeous wide beach always has plenty of room to grab a spot and relax on a towel. For those who like to get about a bit on holiday, the rest of Grand Cayman can be toured really easily. Choose to rent a scooter and cruise through George Town, or head to East End for more natural beauty and a glimpse of the island's original settlement. At the Pedro St. James Historic Site, you’ll be able to tour a restored three-storey early 19th-century great house and outbuildings, with traditional 'grounds' planted with pineapple and banana trees. Grand Cayman's Q. E. II Botanic Park features areas like the Floral Colour Garden (flowering plants and shrubs, succulents and cacti arranged by colour) and orchid and butterfly sections. If you want more waterfront seclusion than Seven Mile Beach can offer you, try the beaches at Smith Cove in the southwest or Old Man Bay in the north. With the tax-free status and hundreds of offshore banks and financial institutions per square mile, there is an exceptional standard of living here, but despite the rich economy, the Cayman Islands remain lovely and unspoiled, basking peacefully in the Caribbean sun. Miles away from their nearest neighbours of Jamaica and Cuba, these three small specks in the vast ocean are known for some of the best scuba diving in the world. Whilst Grand Cayman might be small in size, in every other aspect it is truly "grand." The largest of the three at 22 miles long, Grand Cayman's capital George Town boasts a bustling harbour and, of course its financial district. Shopping here ranges from duty-free merchandise of all types to wonderful local crafts. The turtle farm located here is the only one in the world raising hatchlings to help repopulate the Caribbean Sea. Fringed by tall pines and palm trees, the sheer beauty of the Seven Mile Beach beckons many to its sun-baked sand and warm sea, and if you’re in the market for somewhere to stay on your Cayman Island holiday, you will find all types of accommodation here, plus restaurants, dive shops, and stores. Whatever you do while in the Cayman Islands, don't miss diving or snorkelling with the stingrays at famous Stingray City. Cayman Brac is the middle Cayman island, 86 miles northeast of Grand Cayman (a 20-minute flight), and 12 miles long. 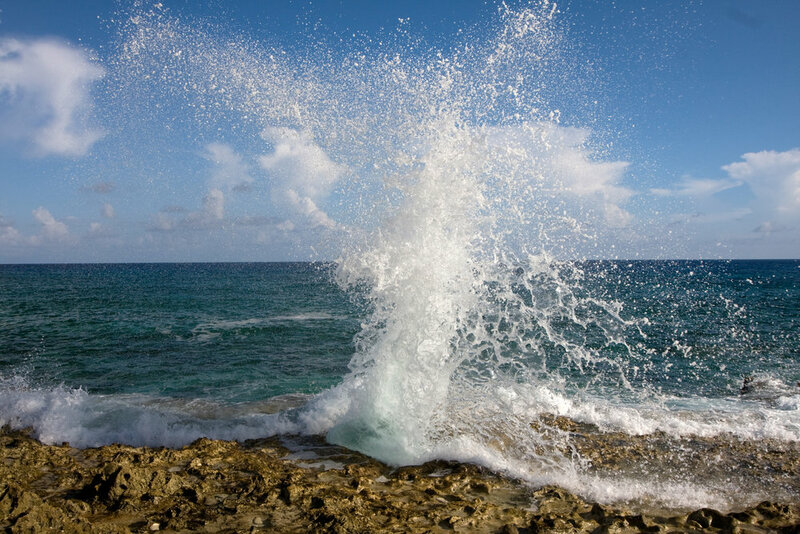 Despite its darker history as a pirate hideout, Cayman Brac today is a peaceful hideaway for divers, fishermen, snorkelers, and those travellers who just want to get away from it all. 150 bird species, iguanas and a colourful variety of tropical plants and flowers call home a nature preserve which sits atop the cliffs. A few small resorts catering to divers help to make Cayman Brac a favourite with the underwater set. Little Cayman lies five miles west of Cayman Brac and has a population of only 50 residents. At just 10 miles long, this coral atoll has changed very little since Columbus' discovery in 1503, the main attraction here being the diving; Little Cayman's Bloody Bay Wall is consistently ranked as one of the top five dive sites in the world which is a high honour for such a tiny, unspoiled beauty. Most of this island's interior is mangrove jungle sporting the third largest bird sanctuary in the Caribbean. The Cayman Island’s weather is glorious, with soft trade winds keeping the Cayman Islands' average temperature at 80° Fahrenheit/25° Celsius with lovely warm waters. 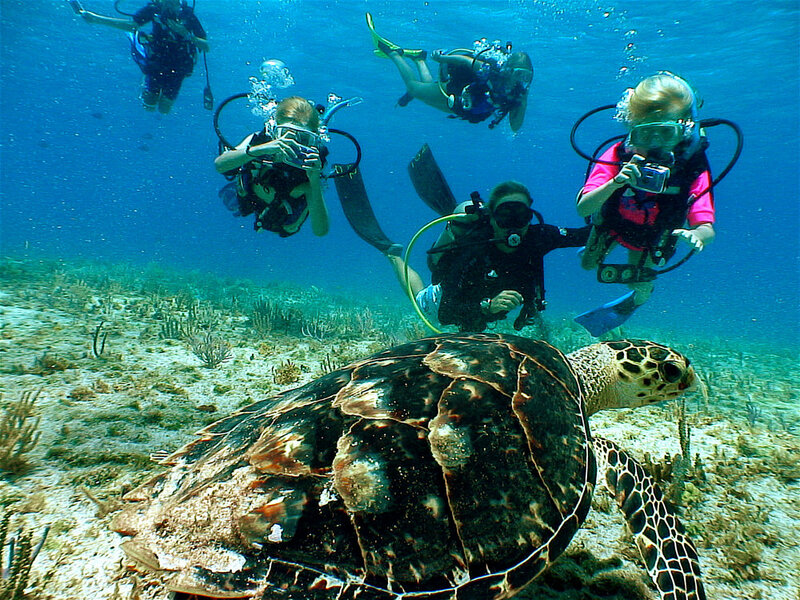 Since scuba diving is so popular here, it’s the perfect Caribbean holiday destination to learn to dive, sharpen up your skills or just to relax and take in the wonderful underwater world.